All dogs have a right to a diet composed of real foods, vigorous outdoor exercise every day, training that is free of cruelty -- and your love. Garrett Rosso began training in the spring of 2000. He completed Basic, Intermediate, and Advanced levels of obedience training with his two Rhodesian Ridgebacks --Java & Kai. Wishing to further his understanding of animal behavior, he completed a multi-year apprenticeship in basic and advanced behavior modification training. He is a member of the Association of Pet Dog Trainers (APDT) and regularly attends and teaches seminars on science-based dog training and behavioral methods as well as taking academic courses in the field. Garrett teaches group and private obedience classes as well as tricks and agility trials. His training and behavioral consultations are always designed for the individual client and come with written diagnosis and comprehensive notes. When appropriate, referrals are made to a board-certified veterinary behavior specialist for medical evaluation. Garrett's special joy is working with reactive dogs or those with behavioral issues (such as fear or separation anxiety) to help reintegrate them into their families and their fellow canine community. Modern dog training is solidly grounded in science and requires no force to shape desireable habits in place of undersirable ones. Most owners find these techniques open a new path of discovery to understanding their dogs and forging a closer bond with them. In addition to his work as a trainer, Garrett was one of the founders of Friends of First Run -- the first official dog park in New York City. "Friends of First Run" works in conjunction with the NYC Department of Parks & Recreation promoting responsible pet ownership throughout the city. Garrett has brought various workshops to NYC parks covering topics from Obedience Training, teaching Agility and Tricks to Spotting Aggression & Safe Handling Practices inside and outside of the dog run. 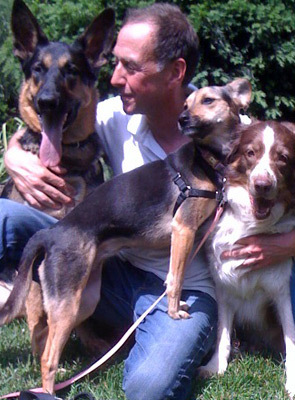 He also promotes a holistic approach to animal care and has presented nutritional workshops which help owners prepare home cooked or raw diets for their dogs. In 2004, Garrett was invited to speak in front of the New York City Council on the danger stray sidewalk voltage pose to our pets. His group advocated yearly inspections of the city's underground electrical grid which received a unanimous vote by the City Council and passed into law in 2004. Garrett was the designer and chief fundraiser - and is currently the manager -- of the newly renovated Tompkins Square Dog Run in New York City which is ranked by Dog Fancy Magazine as one of the Top 5 Dog Parks in the country. Garrett has also served on the Board of Directors of the New York Council of Dog Owner Groups (NYCdog) and consults with the City of New York Department of Parks & Recreation on the construction, design and renovation of city dog runs. Call (646) 675-2125 to discuss training or an exercise program for your dog.